quilling: the art of paper filigree – part 1 of 3 | i made it so. before i talk about quilling, i want to explain what led me to it in the first place. one of my first posts here was all about handmade cards. i think i may have even quoted daniel pink (checking old post) — yup, i did. if you’re not familiar with daniel pink, he is a best-selling author of books about the changing world of work. i don’t normally read these books, but mr.madeItSo was reading this particular one, and he paused to read me a passage. Are you still buying greeting cards that broadcast someone else’s sentiments about life’s most important moments? Show others how much they really mean to you (and demonstrate your empathy) by creating your own cards for various occasions: birthdays, graduations, illnesses or deaths, anniversaries. Kids know how to do this. And so do you. Just fire up your computer’s word processing program and get started. Even better, do it by hand with some blank card and coloured pencils. Anyone can grab a mass-produced card along with the week’s groceries. It takes a special person to spend the time really thinking about what message to send and how best to convey it…. ~ excerpt from Daniel Pink’s A Whole New Mind. c. 2008, used with author’s permission. as for outsourcing my empathy, i try to make cards more often than not, but let’s be honest. there have been plenty of occasions where i’ve let the days slip by and i just run out of time. but when i am able to make a card by hand, it does feel nice. a creative outlet plus something unique and genuine that i can feel good about giving. all this to explain that recently, i made a birthday card and decided to use a new-to-me technique called quilling. i’d never heard of quilling til a few months ago when i came across one of those page-a-day calendars. 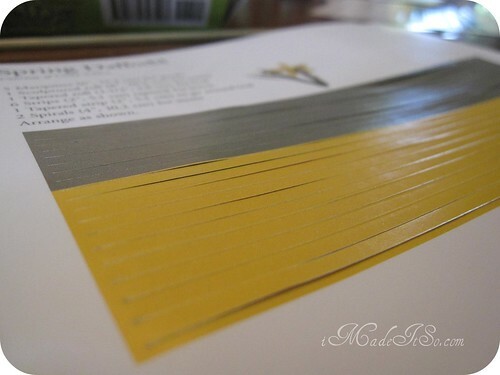 each day had a new quilling project to try, with these long strips ready to use. 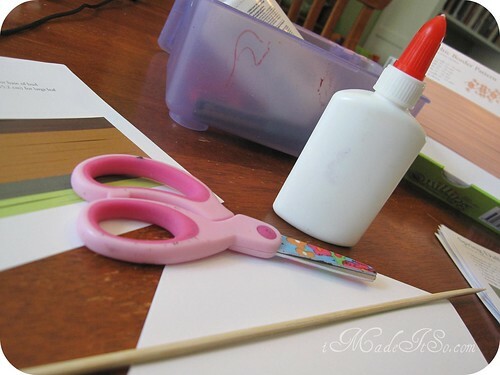 you can obviously cut your own paper into narrow strips if you want to try this craft for yourself. i don’t have a quilling tool, which looks like a needle with a handle around which you coil the paper. i improvised with bamboo skewers and knitting needles. other things i needed: scissors, cardstock and glue. that’s it! what i like about quilling is that you don’t need much to do it, the result is eye-catching, and the possibilities are endless. i’ll share what we made next time in part 2.
but for now, i’m curious about a few things. what do you think about daniel pink’s statement above? do you make your own cards? had you heard of quilling before this? this series was featured on craft gossip. This entry was posted in kids made it so, paper, tools, tips and techniques and tagged cardstock, craft, creating, creativity, daniel pink, handmade cards, paper filigree, quilling. Bookmark the permalink. I was quilling in the 80’s when I was in, oh, the 5th or 6th grade probably. I loved it! I am a paper freak among other things and mix that with my love for miniatures and quilling is right up my alley. I hand cut all the strips from those paper-by-the-pound sheets that were also popular at the time, a toothpick, and a bottle of Elmer’s glue. There is an old, faded, and I’m sure very dusty flower on my mom’s wall that I made her for Mother’s Day one year; she’s afraid to touch it to clean it lest it disintegrate if she looks at it funny. i know! it’s so delicate isn’t it. and there is the whole .. “how the heck do i mail this thing without destroying it?”… but more on that later. I’ve always wanted to try quilling…..Can’t wait to see what you made! I haven’t bought a card in several years but that’s because I’m thrifty like that. I get super annoyed spending up to $5-$6 on just ONE card. I kind of think it’s one big racket actually. I prefer to say what I want to say versus paying someone else to do it for me. i find that the sentiments are never quite right. some come close but most miss the mark. but i’m picky like that. I did quilling when I was in school and in the past few years bought some quilling paper but I haven’t done much with it in my adulthood. I do make my own cards and will rarely purchase one from the store. It is amazing how expensive store bought cards are and I can’t tell you how many times I have received duplicate store bought cards from different people. I have always wanted to learn about quilling. Thanks Ana! I’m so glad you discovered quilling. I happen to be the person who coordinated the Quilling-Design a Day calendar . . . so I am always pleased to learn that it is still introducing people to this beautiful art form. I’ve been quilling since the 1970’s and yes I make most of my own cards, have even blogged about it. I invite you to visit my web site http://www.Whimsiquills.com where there are free patterns, instruction sheets, and examples of my work. Enjoy! I buy unique card when I come across them and save them. Of course now that I live out of a couple of suitcases neither this nor making cards is easy. I love to but time always seems to be the factor. I have heard of quilling, but do not recall ever doing it… maybe in school years ago. It might be a nice project to do one evening with the students. I’m a geek, so the first time I heard about quilling was because of Yulia Brodskaya’s work. AMAZING was some thin paper strips can turn into. hi estivalia… don’t feel badly at all. we do the best we can. when i was a student, people would be lucky if i remembered they existed, let alone remembered their birthday. too funny. were you reading my mind? my big order of quilling supplies just came in the mail on friday. saw it, loved it, immediately ordered the supplies to try it. :o) just started playing with it a little bit, preparing for a blog post about it…and i see you’ve beaten me to it. wondertwin powers ACTIVATE! Hi Ana! Your writing and explanations are very easy to follow, as well as being entertaining. It’s true, in all the years of buying greeting cards I can only think of one that got it absolutely right. Food for thought…. Pingback: quilling: how we made our cards – part 2 of 3 | i made it so. Making my own cards was kind of my first creative project that really stuck. It has been a long time though since I bothered (even sending commercial cards I have to admit). But everything I do these days takes days/weeks/months I keep thinking it might be nice to return to that practice just for some more instant satisfaction and a sense of accomplishment. Thanks for the reminder! Pingback: quilling – ann martin & all things paper: part 3 of 3 | i made it so. Pingback: quilled fail whale revealed | i made it so. Happy Weekend to you and yours! I LOVE this post! I have loved quilling (or the idea of it!) for soooo many years…I do have a love affair with paper. But never the time. I bought a quilling pen this Valentine’s with the hope of making something wonderful, and I even got a brand new paper shredder (perfect for the strips!) for FREE off freecycle! Sadly, I ran out of time. This post is a kick in the pants to try to make it happen. I love the link googiemama added- that will probably be my first project- so cute!! !